If I can’t make it to Germany (like last year), I love celebrating Oktoberfest in New York City. This year there’s a full-day celebration on October 22 - Das Best Oktoberfest- that has me salivating for pretzels, spaetzle, beer and other treats. You don’t have to attend all day – in fact, you choose one of two sessions – and then go to party, see who will be crowned Miss Oktoberfest, and enjoy a variety of other German hilarity. I’ll be at the evening session if you’re planning to attend. The one-day mash-up of authentic oompah, German bands and fun contests happens at La Venue and The Tunnel in West Chelsea (608 West 28th St. between 11th and 28th), on Saturday. There you'll find unlimited samplings of more than 150 international and craft beers, wines and schnapps, plus German-inspired cuisine. You can buy tickets for either or both of the two sessions: 12 Noon- 4pm or 5:30pm-9:30pm, for $65 in advance or $80 at the door. You must be 21 or over to attend. A Grand Oompah Tasting Session is also available at $150 for a limit of 100 brave souls who care to attend both sessions and are interested in attending a special German Tasting Seminar. To entertain you while you eat and drink, there will several photo-worthy contests, and winners each win $100. The Beer Belly Competition calls out the gentlemen who think they have the best ‘figure’ with judging based on appearance and personality; the Miss Oktoberfest Contest critiques the best merry maid on her appearance, costume and knowledge of Oktoberfest; and the Pretzel Necklace Competition shows off food and creativity. This over-the-top taste, eat and dance experience is dubbed as ‘das’ best day of beer sippin’, sausage tastin’, music listenin’, and lederhosen wearin’ (at least on this side of the Atlantic). 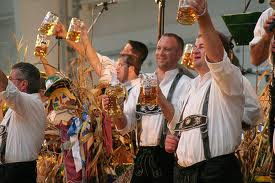 Tickets and additional information are available online at www.nyoctoberfest.com.